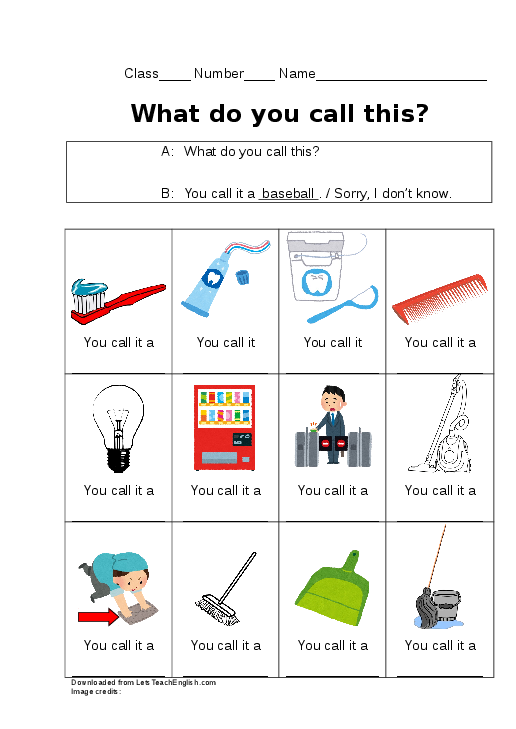 In this activity the students walk around the room and ask each other "what do you call this" while pointing to objects on their worksheet. Other students supply the answers from cards they are given at the beginning of the activity. The goal is to fill in the worksheet, learning the names of all the objects on it. 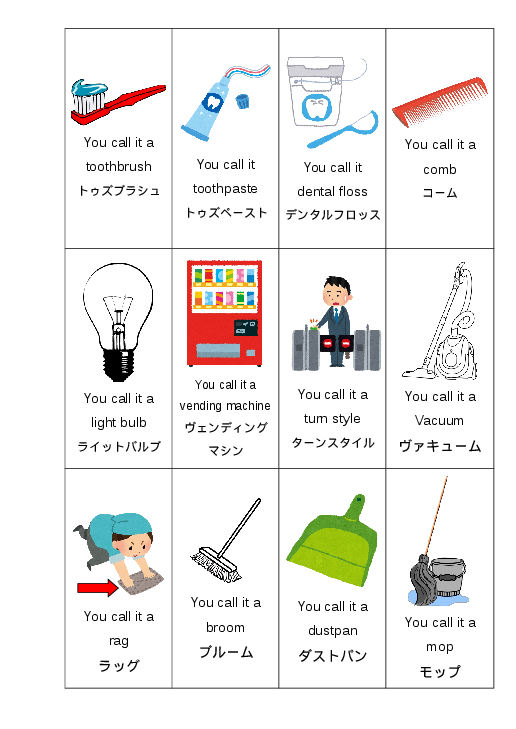 The objects are: a toothbrush, toothpaste, dental floss, a comb, a light bulb, a vending machine, a turn style, a vacuum [cleaner], a rag, a broom, a dustpan, and a mop. 0. Introduce the grammar “call.” I did this by printing up 4 or 5 pictures of somewhat rare (or fake) animals (e.g. manatee, salamander (uupaaruupaa), platypus, jackalope). Using the pictures, I asked the JTE "what do you call this in Japanese?" and then said "oh, you call it a ~ in English." After the first two pictures or so, I started asking the students directly, instead of the JTE. After the students worked out the grammar more or less on their own, and after a brief talk about jackalopes, I wrote the key phrase up on the board, and explained it briefly. 1. Hand out the worksheet, and give each student 3 different cards. Instruct them not to show their friends their cards. 2. Read the dialog with them, and make sure that they understand it. 3. Have them walk around the room and ask each other "what do you call this," pointing at objects on their worksheet. If they have the card with that word, they answer "You call it a ~." Because all the words are new to them, it's best to allow them to write the words down in katakana.